Ink applied with pen and brush on paper on paper. In the middle of September 1913 a work by Joaquín Torres-García entitled Notes sobre art appeared in Gerona, published by Rafael Masó. It was a collection of texts on aesthetic subjects that had previously appeared in periodicals, in particular in La Veu de Catalunya. This book was the first in a long series of writings by Torres-García, and sums up the evolution of the Uruguayan artist since his first steps in the field of illustration in Barcelona to the Noucentisme period. "The purest art", he wrote in a chapter entitled "Intel.lectualisme de l'art" (The intellectualism of art), "the intellectual art, the truly ideal art, also comes from the side of reason. Since without measure and proportion, order and logic, we cannot conceive a perfect work [...]. The bohemian artist, the romantic artist, the instinctive artist, in short, the prosaic or ignorant artist, must give way to the artist-philosopher". Torres-García himself had clearly adopted some years before this view of the artist-philosopher, pursuing the same ideals supported by Eugeni d'Ors and the promoters of Noucentisme, turning Catalonia, a Latin land, into the symbol of the Mediterranean cultural tradition. In 1911, the president of the Mancomunitat, Prat de la Riba, commissioned him the decoration al fresco of the ceremonial hall at the Palace of the Generalitat, the Salò de Sant Jordi, a large hall at the front of the building forming a kind of salle des pas perdus. The painter embarked on this enterprise with great enthusiasm. 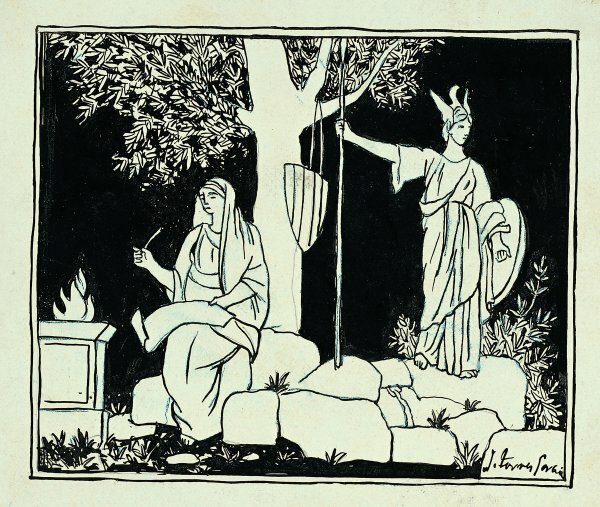 In 1912, he travelled to Italy to study the technique of al fresco painting and on 28 July 1913 he began his first fresco, La Catalunya eterna, of which the drawing presented here is a sketch. The scene is organised around a tree from which hangs the coat of arms of Catalonia. This thousand year old leafy and protective tree, the symbol of life and regeneration, is the tree of the homeland, of the eternal Catalonia, sung by poets and philosophers, and taken as example in the nationalist political discourse of the time. Torras I Bages, one of the pillars of the nationalist thought of the period, whom the painter greatly admired, referred to it in La Tradició Catalana, published in Barcelona in 1892: "The passing of time can lessen this magnificent bloom of our land; but as long as the immense wealth of the spirit remains, the tree of the homeland will be like Horatio's which, with the change of seasons, loses its leaves in order to cover itself with new foliage, the same but even more beautiful". The tree is flanked by two female figures. One, watching over a hearth, represents "the Tradition of the pure and inextinguishable flame of the language", as Torres himself declared during an interview with Vicente Solé de Sojo, published in El Día Gráfico of 24 December 1913. Her head is covered with a veil, as was the Roman goddess Vesta or the Greek Hestia, whose mission was to protect day and night the fire of the hearth, in this case the flame of Catalonia. The language is symbolised by the pen and parchment held by the vestal, and the inscription "verb" which can be seen on the frontispiece of the hearth. The other woman, who is standing, is the image of the Greek Pallas Athena, with her helmet, shield and spear, the goddess of war who had protected Athens, the defender of just causes, but above all the goddess of wisdom and of thought who governs intellectual activity. This figure can be linked to one of Torres' noucentistes masterpieces, his great classical composition Pallas Introducing Philosophy as the Tenth Muse in the Helicon, a painting of 1911 to which he gave the title of Filosofia Xa Musa, and which once belonged to Eugeni d'Ors. Torres-García had thus claimed a central role for "speculative subjects", and more concretely, for philosophy, in his article La nostra ordenació; el nostre camí, published in April 1907 in the review Empori. He developed these ideas in 1915 in his book Diàlegs: "If the aim of art is to search for eternal things, which should you choose among these? Tradition has to be composed of all that, in our universe, is in agreement with the Earth, and not with men or their works, when they are not in harmony with the Earth. Look now at the Land and the Sea. What are they telling you? They tell you what we have already said: out of this sea so blue and this immaculate foam Aphrodite could be born again [...] under this climbing vine, the joyful Dionysus would feel at ease; the pillars of the temple are in perfect harmony with the trunks of the pine trees, as beautiful as those in sunny Italy; and that olive tree, is it not the tree of Pallas? ".